In one of my last posts, I described the current (sad) state of managing Docker container and image expiration. Briefly, Docker creates new containers and images for many tasks, but there is no good way to automatically remove them. The best practice seems to be a rather hack-ish bash one-liner. Since this wasn't particularly satisfying, I decided to do something about it. Here, I present docker-cleanup, a Python application for removing containers and images based on a configurable set of rules. # more than a week ago. # Delete dangling (unnamed and not used by containers) images. Clear, expressive, straight-forward. The rule language can do a whole lot more and provides a readable and intuitive way to define removal policies for images and containers. Head over to GitHub, give it a try, and let me know what you think! # s[4:9] is internally converted (and equivalent) to s[slice(4, 9)]. slice object can be used in normal code too, for example for tracking regions in strings: instead of having separate start_idx and end_idx variables (or writing a custom class/namedtuple) simply roll the indices into a slice. # Compute the column slices by parsing the header. Gives a list of slices. This is mostly useful when the indices are computed at runtime and applied to more than one string. More generally, slice objects encapsulate regions of strings/lists/tuples, and are an appropriate tool for simplifying code that operates on start/end indices. They provide a clean abstraction, make the code more straight-forward and save a bit of typing. pdb is a console-mode debugger built into Python. Out of the box, it has basic features like variable inspection, breakpoints, and stack frame walking, but it lacks more advanced capabilities. Printing instance variables is great for quickly inspecting objects, but it shows only one half of the picture. What about the class-side of objects? Properties and methods are crucial for understanding what can actually be done with an object, in contrast to what data it encapsulates. # Print contents of an object's class (including bases). # 'proc' is a multiprocessing.Process() instance. (Pdb) pi proc       # In contrast, here is the image dictionary. In general, pc focuses on the interface while pi examines the state of the object. The two complement each other nicely. Especially when working with an unfamiliar codebase, pc is helpful for quickly figuring out how to use a specific class. pc works with both Python 2 and Python 3 (on Python 2 it only shows new-style classes). Add it to your .pdbrc and give it a try. Let me know what you think! Use an alternative Python implementation for impressive speed-ups. 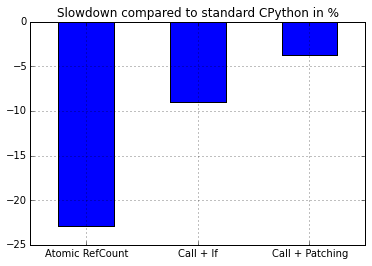 For example, PyPy is on average 7 times faster than the standard CPython. Not all parts of a program have to be blazingly fast. Use Python for all non-performance-critical areas, such as the UI and database access, and drop to C or C++ only when it's required for for CPU intensive tasks. This is easy to achieve with language binding generators such as CFFI, SWIG or SIP. A further performance-related issue is Python's Global Interpreter Lock (GIL), which ensures that only one Python thread can run at a single time. This is a bit problematic, because it affects PyPy as well, unless you want to use its experimental software transactional memory support. Why is this such a big deal? With the rise of multi-core processors, multithreading is becoming more important as well. This not only affects performance on large servers, it impacts desktop programs and is crucial for battery life on mobile phones (race to idle). Further, other programming languages make multi-threaded programming easier and easier. C, C++, and Java have all moved to a common memory model for multithreading. C++ has gained std::atomic, futures, and first-class thread support. C# has async and await, which is proposed for inclusion in C++ as well. This trend will only accelerate in the future. With this in mind, I decided to investigate the CPython GIL. Previous proposals for its removal have failed, but I thought it's worth a look — especially since I couldn't find any recent attempts. The results were not encouraging. Changing the reference count used by Python objects from a normal int to an atomic type resulted in a ~23% slowdown on my machine. This is without actually changing any of the locking. This penalty could be moderated for single-threaded programs by only using atomic instructions once a second thread is started. This requires a function call and an if statement to check whether to use atomics or not in the refcount hot path. Doing this still results in an 11% slowdown in the single-threaded case. If hot-patching was used instead of the if, a 6% slowdown remained. The last result looks promising, but is deceiving. Hot-patching would rely on having a single function to patch. Alas, the compiler decided to mostly inline the Py_INCREF/Py_DECREF function calls. Disabling inlining of these functions gives a 16% slowdown, which is worse than the "call + if" method. Furthermore, hot-patching is probably not something that could be merged in CPython anyway. So what's the conclusion? Maybe turning Py_INCREF and Py_DECREF into functions and living with the 11% slowdown of the single-threaded case would be sell-able, if compelling speed-ups of multithreaded workloads could be shown. It should be possible to convert one module at a time from the GIL to fine-grained locking, but performance increases would only be expected once at least a couple of core modules are converted. That would take a substantial amount of work, especially given the high risk that the resulting patches wouldn't be accepted upstream. Where does this leave Python as a language in the multi-threaded world? I'm not sure. Since PyPy is already the solution to Python's performance issue, perhaps it can solve the concurrency problem as well with its software transactional memory mode. PS: My profiling showed that the reference counting in Python (Py_INCREF() and Py_DECREF()) takes up to about 5–10% of the execution time of benchmarks (not including actual object destruction), crazy! I use SIP in MapsEvolved to generate bindings for interfacing Python with C++. I really like SIP due to its straight-forward syntax that mostly allows just copying class definitions over from C++. Further, it's really well thought out and contains support for a number of advanced use cases. One such feature is implementing a C++ interface in Python. The resulting class can then even be passed back to C++, and any methods called on it will be forwarded to the Python implementation. Sweet! Here, the C++ function visit_graph_nodes() calls the Python method pnv.OnNode() for every node in its (internal) graph. A zip file with the full working source code of this example can be downloaded here. The subclassing capabilities of SIP don't stop at interfaces, either. It's possible to derive from any C++ class, abstract or not, inheriting (or overriding) existing method implementations as needed. This gives a lot of flexibility and makes it easy to have classes with some parts implemented in C++, and others being in Python. Configuring a modern web server to employ strong encryption and forward secrecy doesn't have to be hard. There is excellent documentation from Mozilla and from the OWASP. One major stumbling block is where to obtain an SSL certificate. In the future, this should hopefully be easy with Let's Encrypt. Until that is actually functional, StartSSL offers free SSL certificates. The process takes a bit of patience, but it's not difficult. There's also a StartSSL HOWTO from h-online.com. it's crazy cheap: 7.45$ per year. With the certificate acquisition out of the way, here are the juicy bits from my Apache config. # Enable only cyphers that support forward secrecy. # Use server priorities for cipher algorithm choice. # With Apache 2.4, SSLv2 is gone and only SSLv3 and TLSv* are supported. # Disable SSLv3, all TLS protocols are OK.
# without having to query an external OCSP service. SSLCertificateKeyFile   /path/to/serverkey.key    # The private server key. SSLCertificateFile      /path/to/certificate.crt  # The certificate provided by CA. SSLCertificateChainFile /path/to/cert-bundle      # A separate download from your CA. # Use a customized prime group for DH key exchange (vs Logjam attack). # HSTS: Force browsers to require SSL for this domain for the next year. # Down-grade to HTTP will cause browsers to abort with a security error. # HPKP: Pin the current key for the next two months. # in case the primary key is lost or compromised. # Also note the implications for key rollover. Header always set Public-Key-Pins "pin-sha256=\"<HASH>\"; max-age=5184000; includeSubDomains"
# Disable compression to avoid BREACH HTTPS/SSL attack. As for SSL connection testing, I found the Qualys SSL Labs Test helpful. It shows what browsers (browser versions) will get which encryption quality (forward secrecy or not) and highlights common problems such as certificate chain issues. Docker doesn't delete old/unused images or containers by itself, even if they weren't used for a long time or were only intermediary steps on the way to another image. This leads to an image sprawl that eats up a lot of disk space if not kept in check. The right way to solve this would be to parse the output of docker inspect and remove containers and images based on certain policies. Unfortunately, a quick internet search did not turn up a script that does this. The first line removes containers that are older than two weeks and are not currently running (docker rm simply will not remove running containers). The second line removes images that are not used by any container and are not tagged (i.e. don't have proper repository name). These two invocations are based on this Stack Overflow question and on this blog post by Jim Hoskins. Docker is a virtualization solution that's been gaining a lot of momentum over the last few years. It focuses on light-weight, ephemeral containers that can be created based on simple config files. Docker's main target platform is amd64, but it also works on x86. However, practically all official container images in the Docker registry are amd64 based, which means they can't be used on an x86 machine. So, it's necessary to manually create the required base images. As you might have guessed, my server runs Docker on x86, so I've had to find a solution for that problem. The script can then be found under docker/contrib/mkimage.sh. This will use httpredir.debian.org as mirror and install the locales package in the image. mkimage.sh has backends to bootstrap Arch Linux, Busybox, Centos, Mageia, and Ubuntu. Fedora images doesn't seem to be supported directly, but they can be generated by following instructions compiled by James Labocki. Finally, it's worth mentioning that this should only be used to generate base images. You'd then use Docker itself (cf. Dockerfile) to create images that actually do something interesting, based on these base images. This will save both time and memory, due to Docker's caching and copy-on-write mechanisms. I bought my Samsung Galaxy S2 in 2011, and it's still going strong. It really was a great phone for the time and held up incredibly well. Unfortunately, Samsung's support has ended long ago, and users are stranded with an obsolete (and insecure) firmware. Fortunately, CyanogenMod still provides relatively recent images for the device. As of this writing, snapshots of CM11 (based on Android 4.4) are available, but there are no images of CM12. Here is how I flashed CM11 to my phone. This is based on the official CyanogenMod wiki page for the SGS2 and on this xda-developers post. Since you can brick your phone if you don't know what you are doing, I suggest reading both of these pages. Note that you will need to factory-reset your phone, so backup all your data (files, apps, SMS, contacts, ...). All the following steps have to be performed on a root shell on Linux. gapps-kk-20140105-signed.zip: Google Apps package; note that version >= 20140606 may not work: check the WARNING section on the CM wiki. Recovery_CWM_6.0.4.7_I9100.zip: Newer recovery image required to install CM >= 11. Boot the phone into download-mode (shutdown, then VOLDOWN + HOME + POWER) and connect to the Linux computer. Disconnect the USB cable and hold POWER until the phone shuts down. Reboot into recovery (VOLUP + HOME + POWER, let go of POWER after 5 seconds or you'll trigger a reboot). Then reconnect the USB cable. chroot#  adb devices    # Check if device recognized. In recovery, select "install from zip file" to flash the new recovery image. Then go into advanced -> "reboot recovery". Mount /storage/sdcard0 in the recovery menu, then reconnect the USB cable. Again, in recovery, select "install from zip files", first install the CM image, then the GApps package. Select "reboot" to boot into CyanogenMod. Shut down again, reboot into recovery, wipe cache and perform factory reset, reboot into CM (avoid factory reset with stock kernel due to the "super brick" problem). On Monday, checklib was finally announced on debian-devel-announce, thanks to Andreas Barth for sponsoring the mail. I got very positive reactions from a number of people, which is great. I got less friendly comments prior to the announcement (by one person) , and I'm happy this reaction wasn't representative for the rest of Debian. It's nice that people show interest in the problem, there's currently a discussion on debian-devel if and how automatic checking (and fixing) could be added to debhelper. That would seriously rock, as it would be one of the faster ways to get the number of affected packages down. It's also cool to hear that the GNOME people are fixing their .la files with 2.16 in order to cut down dependencies introduced by broken libtool files. There are some other interesting things on the horizon on the technical side of the project, as automatically built dbgsym packages (containing debug symbols, Ubuntu does that already), and the idea Simon Richter already talked about, which could really cut down the work the release team has with library transitions.